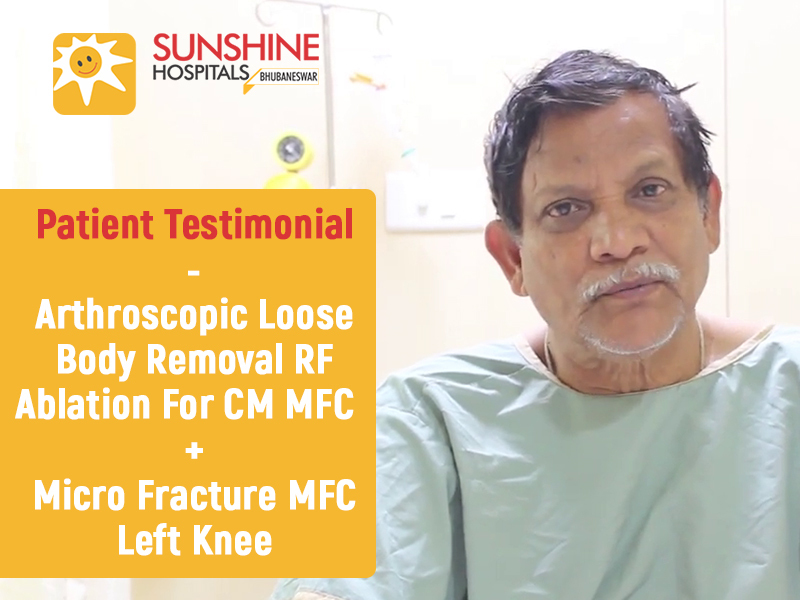 Mr. Pradeep K Das, 66 years old underwent an Arthroscopic Loose body removal RF Ablation for CM MFC and Micro Fracture MFC to Left Knee by Dr.(Maj) Sarthak Patnaik, Consultant Trauma Surgeon, Arthroscopy & Sports Medicine at Sunshine Hospitals Bhubaneswar. Sunshine Bone & Joint Institute is the second largest joint replacement centre in Asia, on average, we perform 4000 joint replacements every year. Our Orthopaedic department headed by renowned Orthopaedic Surgeon Dr A.V. Gurava Reddy and our Joint Replacement department comprises of an experienced and skilled team of more than 20 doctors who perform around 20 joint replacements (Knees and Hips) every day. Mr. Pradeep K Das, who got Micro Fracture MFC to Left Knee talks about the treatment and doctors in his own words.